Our launch product is our 1677 series plug, which is offered mainly in 1/0 and 2/0 with a Comfort Grip® ahead of the strain relief cable exit area. This connector has dramatically reduced contact splay. Skyko International's 3D mold manufacturing process produces a mold that reduces the stresses introduced into the rubber during the cooling process. The shrinkage is reduced by superior design. Reduced splay translates into reduced pin wear on the aircrafts receptacle. Skyko International’s 1677 series AC Plug Assembly is made to Mil-C-7974 standards using Mil-C-5756 electrical cable therefore meeting the MS90328 specifications. 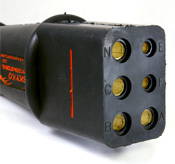 The 1677 plug is a molded rubber plug fashioned to make the plug comfortable to grip for installation and withdrawal. The assembly is banded with non metallic bands with a nylon strap underneath the band. Terminal lugs are finished with phase marking plus shrink tubing covering the transition from the insulated cable to terminal lug. The design of the tooling allows the rubber to flow into the cavity with out stressing the compound. Skyko International’s 1677 Series Plug has minimal misalignment from front to back of the socket contact. Our plugs have very smooth insertion forces requiring substantially reduced forces to engage and disengage the plug. Skyko plugs are just better by design which proves that this company is Driven to build Products that Perform. Your company can also “Choose to Reuse” call us now to find out how our programs can convert your tired cable assemblies back into safe usable warranted products.